In 1898, British archaeologists James E. Quibell and Frederick W. Green discovered a ceremonial object going back to the 31st century BC at a site dedicated to the falcon-headed Horus (god of the sky/kingship/war/hunting) in the ancient city of Nekhen or Hierakonpolis (modern-day Kawm Al-Ahmar in Egypt). Now kept at Egyptian Museum in Cairo, this palette – an elaborate form of a basically utilitarian item meant for the preparation of eye makeup – is made of grey-green siltstone and measures about 64 cm in length. It contains some of the earliest hieroglyphic inscriptions and is considered a kind of blueprint for Egyptian art of the subsequent 3000 years. The pharaoh Narmer (also identified as “Menes”), whose name the palette bears in phonetic lettering, is believed to have unified Upper and Lower Egypt (c. 3100 BC) and, in that way, brought an end to the Pre-dynastic period and instituted the First Dynasty (see timeline of the entire Egyptian civilisation here). On one side, we see an outsized Narmer wearing the pharaonic White Crown of Upper Egypt (called “hedjet”) and smiting a captive. His attendant stands in the background with his sandals. A hawk (symbol of Horus) on the right holds a tether (symbol of Lower Egypt) incorporating six heads of papyrus. At the bottom, Narmer’s foes lie dead with a little walled city. Perhaps they are personifications of the cities he has conquered. On top, in the centre, Narmer’s name is inscribed with symbols of a catfish and chisel inside a palace. On either side are heads of cow-goddess Bat (or Hathor). The reverse side of the palette is more complicated. The top remains the same. 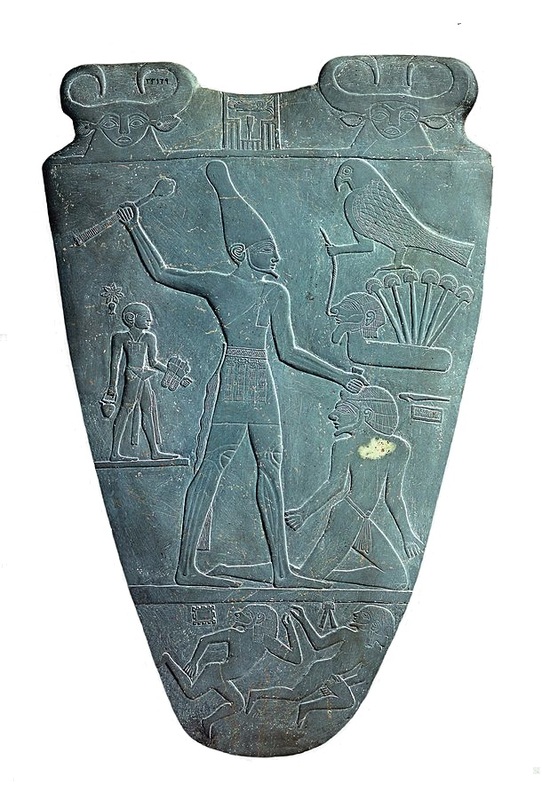 Then, Narmer, followed by his sandal bearer, is now seen in the pharaonic Red Crown of Lower Egypt (called “deshret”). Before him a priest marches with a procession. Extreme right, Narmer’s foes lie decapitated and castrated. In the centre of the palette, a pair of serpopards (mythical creature that is half-serpent, half-leopard) with entwined necks create a recess within which cosmetics would have been ground. At the bottom, a bull is shown knocking down the walls of a city. It is probably a personification of the king. The meaning of the inscriptions has remained a topic of much debate among scholars. Most take it as a document demonstrating the unification of Upper and Lower Egypt. According to Egyptologist Dr. Amy Calvert, more recent research on the palette “has connected the imagery to the careful balance of order and chaos (known as ma’at and isfet) that was a fundamental element of the Egyptian idea of the cosmos”. 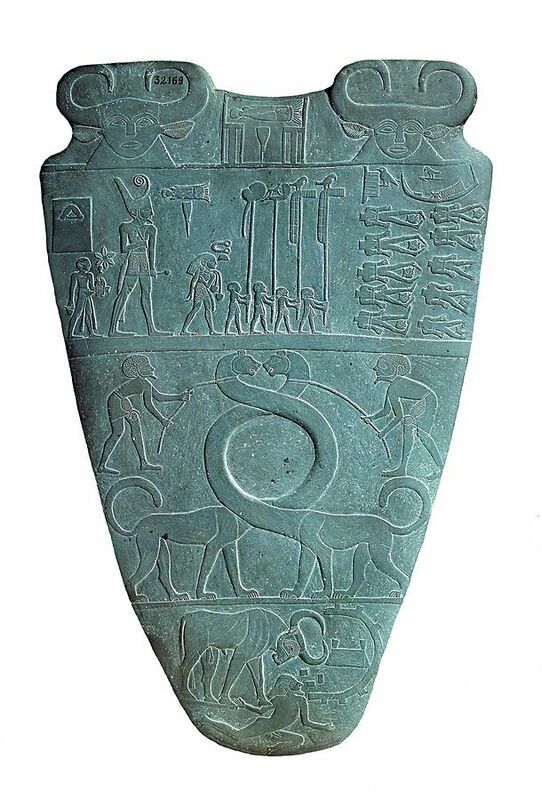 (“Palette of King Narmer”, Khan Academy). Art is probably the only thing that has transcended across time..! while this may or maynot be the actual representation of the unification, the way a story has been represented is beautiful!